Who doesn't love to be drunk at midday? You know when you've lived in a city all your life and you feel it's lacking that certain je ne sais quo that attracted your parents, or perhaps it was the lack of excitement that made them settle here. Well, Phil Innes, owner of the new wine merchants (first-ever in Birmingham) Loki Wines has decided it's time to start a movement. Keen to shrug off the idea that he's an entrepreneur Phil is a friendly, knowledgeable young man with a degree behind him that he has used to create a stunning venue that will have you frequenting for midday drinks, after-work drinks, and drinks well past the arcade's bed time, but more on that later. Loki Wines is firmly ensconced in the 21st century, yet has a vintage wine charm that pulls you inside. As for appearances Loki Wines initially appears a humble, but modern little wine merchants, pretty décor, modern interior, but, y'know, modest. Lest we forget appearances are deceiving head upstairs and you'll discover a surprisingly spacious area with dark wood, dark buttoned leather seats and a green and aubergine colour scheme. Upstairs is almost a boudoir area but also a chilled wine luxe space. It takes your breath away and appears a very cool, very exclusive members only club. Select artwork is dotted around, adding a kitsch, but modern feel. Phil happily says how people constantly note that Loki's could be easily mistaken for a bar in Soho, London. It's his biggest compliment considering but he's in a historic arcade slap bang in the middle of Birmingham city centre. Brilliant. 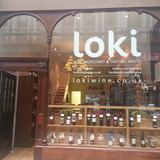 Loki is the Norse God of mischief, he was against the more traditional Gods, which is Phil's ethos; he has tried (and succeeded) at squashing the old fashioned pretentious ideas about wine, hence the somewhat dubious name for the shop: Loki. The double entendre works well because Loki is that's exactly what it is. Low key, in a now-famed-for-independent-shops-arcade and unassuming from the outside. But oh Loki is very much the former definition that is making headway in the wine world. The technology in the store ensures this is a winery very much in the 21st century. Phil's POS system is on his ipad, inventive. He also has his prized investments that attract passers-by: wine-tasting machines. Now this is a Birmingham first. Wine tasting machines are pure innovation, but mostly for the atmosphere. I'm curious as to how they work and Phil explains: "Customers get a tasting card, with a minimum of £10 top up. You can sample wines from 30p but obviously it depends on the wine as to how much the sample is." Phil describes the experience as "mini wine tasting every time you come, plus one on one wine tasting with an expert." Loki's is open Monday to Wednesday 10-7pm, and 8pm on Thursday and Friday. The extended opening hour seems obvious as the weekend approaches, however Phil confides it's more underground than that. The arcade closes at 8pm on Fridays, but Phil, being the good wine merchant stages a lock in, where things get quite rowdy and Loki's stays open til 11pm! Great for a bit more of an exciting lunch break or after work drinks. It works as a social space where you can get involved in the tasting experience. Phil is passionate about wine, but he seems more focused on making the business a success, and ensuring the customer is happy. Utilising his degree in urban design master planning Phil has created a space where his marriage of bar and shop does work. Even down to the little details such as the rounded barrels that work as table tops, as opposed to angular shapes, Loki Wines is all about social times: from the cheapest £6.99 per bottle to his most expensive £385 Australian wine. With an owner this involved who calls wine 'lovely' it's not hard to consider this the best new winery in town. Six years at Oddbins served him well, Loki Wines is a delight. Why? Loki Wines is firmly ensconced in the 21st century, yet has a vintage wine charm that pulls you inside. When: Monday to Wednesday 10-7pm, and 8pm on Thursday and Friday.